Nam Myoho Renge Kyo ~ Chant For Happiness: PowerPrayer for Success at Work and in Kosen-rufu! PowerPrayer for Success at Work and in Kosen-rufu! 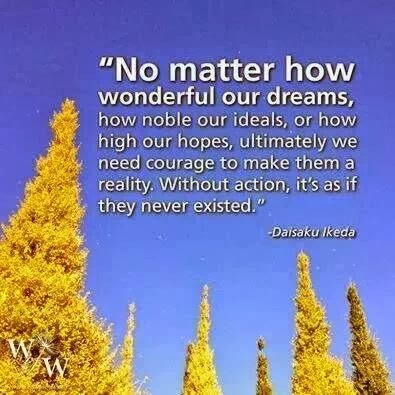 In The Heart of the Lotus Sutra by Daisaku Ikeda pages 68 through 70 perfectly sum up the nature of attachments and desire in Nichiren Buddhism. "Shakyamuni taught the people of the nine worlds, whose lives were steeped in misery, the path for freeing themselves from such attachments (defined as a 'fetter on one's heart'. That is, he caused them to renounce their attachments. "The spirit of the Lotus Sutra, however, is not to eradicate earthly desires. When we base ourselves on the Mystic Law, we can transform desires ~ just as they are ~ into enlightenment. This is the principle that earthly desires are enlightenment." This morning I was awake before 4:00 am thinking of all the things I need to get done. Tonight is an SGI planning meeting at my house and I have a guest coming. I am spending the day mostly out of the office at a Rotary Club meeting and a few appointments at my new job for kosen-rufu! My title is Senior Community Outreach Specialist and I generate referrals and new business for the beautiful retirement community I work for. This community has so many ways to help seniors live their best lives. Seniors can live here in Independent Living, Assisted Living, skilled nursing or join us for a respite stay or short term rehabilitation. People who live in the surrounding community can use our non-medical home care, handyman services for work inside or outside the house, or technical support service professionals who can visit their homes to help with telephones, ipads, TVs, etc. We even have a fitness center and outpatient rehab. And above all it is a community that has a promise of respect for all. Perfect for me, right? This job is huge benefit, with 300 employees and a fabulous mission for helping people. I meet new people and make new friends every day! So, of course there is a lot on my mind, and this morning I wrote a PowerPrayer to increase my peace of mind, remind myself of all I am capable of, focus my goals and keep my life condition high. PowerPrayers are a means to focus while chanting Daimoku. and composure in all things! I am in the right place at the right time! Thank you! Make my life condition sky high, so that no matter what happens all day long my life conditions shines for all to see. and for wisdom to flow through me. I am now more organized and productive than ever! I will show actual proof today and every day in all I do. This job and my life IS kosen-rufu in ACTION! Keep my self confidence high! Wise choices flow through me. I See and capture every positive opportunity. and moving it forward in a positive direction. I accomplish my work goals of _______________by ____________. And help others accomplish their goals too. to be an indispensable employee. so that President Ikeda would proudly say "Yes! ___________(your name here!) is my disciple!" great job for the humanity!thanks and go bless you! !